I can tell when my son is reading - and I leave him to it. There's a certain hush that falls over the house, over his room. A certain intermittent squeak to his armchair. A kind of quiet that I can't explain, but which I know means that he's upstairs in his room reading. That's when I leave him alone. The other day I was heading up to his room to ask him if he'd brushed his teeth... and I heard that silence that meant he was reading. I stopped in my tracks on the stairs. I didn't stick my head in his door. I didn't call out and ask if he was reading. I just went quietly back downstairs. When kids are actively reading, they create a quiet bubble around themselves. 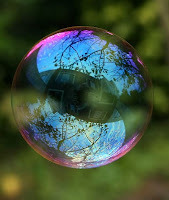 It's a bubble they fill with the fantasy creations they imagine as they read. It's a bubble so necessary for a reader, and yet so easily burst. If you catch your child reading, remember that bubble. Remember that your child needs that special quiet fantasy world where he can dissolve into the words on the page. Let him go there, give him some time to himself within that bubble, and you'll be helping to create a reader. Last weekend I was watching a child, on the edge of a baseball diamond during a tournament, who was in a Harry Potter bubble. Last fall I remember seeing - in the midst of a noisy kids' marathon - a boy sitting on his heels, reading, in his quiet bubble. I remember my own reading bubbles from my childhood, and how precious that book-time was to me. Sigh. I agree with this so much and am sad that within a child's school day their reading bubble might be interuppted several/many times over. You know, it reminds me of when you're in the hospital trying to recover (or whatever) and the nurse wakes you up three times in the middle of the night to take your blood pressure.